Is life getting heavy for you? Rest here for a moment and find encouragement to persevere. You are currently browsing the category archive for the ‘introducing reading by grandfather’ category. Financial investors know how important it is to start saving and placing those precious finances into income-earning locations. Parents and grandparents know how important it is to invest as well. They start young lives with the joy of reading. Books introduce the world of imagination, learning and life about the world in which they will live. My first grandchild is two this year. As the day drew to a close and washing up had been completed, he gathered his blanket and an armful of books and ran into my arms, climbed into my lap, curled up so that he was comfortable and then he pointed to his books, gesturing for me to read to him. He buried himself deeper into my hug. I picked up the top book and opened it up to the first page. These board books are fun to read. Colorful characters and simple stories with clad truths make it fun. Even though I have never read these books, it was easy to put in a lot of expression and emphasis. 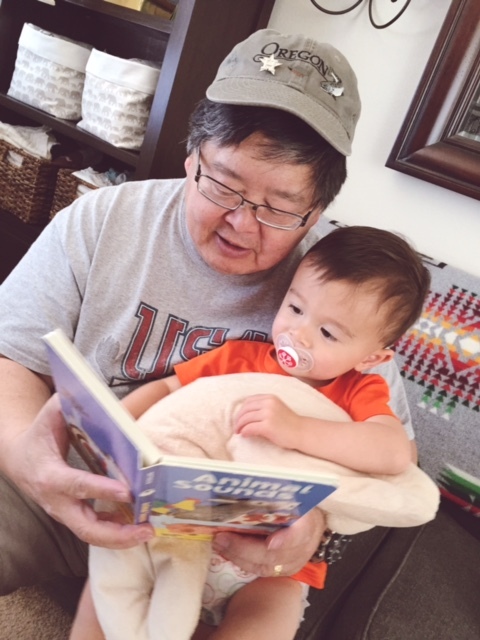 The meaning of the lesson became more and more clear as I read to my grandson. There were easy moments for me to ask him to point to colors, animals and objects on the page. He was participating and no doubt learning while he snuggled in my embrace. It was my first time in the role of grandfather reader. I was relishing the moment. This has been a dream to invest in these little lives this way. I could introduce him to so many wonderful ideas and reenforce some of life’s most important values. In brief well designed books, I taught my grandson about friendship, initiative, community, helpfulness and loyalty. He learned about telling the truth, honesty and industry. He will need these qualities when he lives his life among people who are not so helpful to others. All during the reading I was thoroughly enjoying the cuddle moment. My grandson curled up and tucked himself in a comfortable position, inside Grandpa’s embrace. It was a special moment. He is young but I hope that the love that we shared will always be a part of his life. It will for me. Reading and books and grandfather’s bonding time are treasures. Did someone read to you in your childhood days? Do you remember going to a library in your youth? Classic novels probably still leave memory moments in your mind, right? Always Hope "Life is rough. Never give up. Believe." Real Life: "Determined to discover that each new day is worth living." Shepherd Strong: "Living 1 & 2 Timothy"